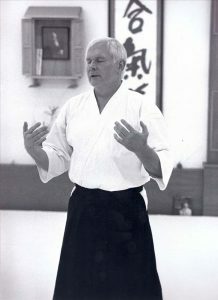 John Stevens Shihan recently taught a series of classes in the Bay Area, and on Wednesday, September 26th 2018, he gave a talk at Many Rivers Books in Sebastopol, CA. Many Rivers graciously allowed us to make the recording available on our website. Sensei Stevens talked about his writing, and highlighted how The Art Of Peace ended up on the popular show “The Walking Dead”.